Limited Edition Green Colored Vinyl. 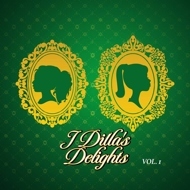 After releasing Motor City, The King of Beats Vol 1 & 2, the Ma Duke's Collection, and the Jay Dee aka King Dilla beat compilations all over the last year or so, the world is graced with yet another stellar posthumous release, a two volume beat tape from J Dilla, Dilla's Delights Vol. 1 and Vol. 2. It seems the powers that be are heeding the call for more joints from the vault. And we're not mad. Not even a little. Real hip hop fans can rejoice, in a time of watered down trap rap and shiny suits. Will the wellspring ever run dry? Are we soon to arrive at the end of this 11 year grace period with the GOAT? Time will tell, but so long as the heat keeps coming, we'll be quietly sitting in the corner blessing the air and pouring one out for the late Dilla Dawg. And the best part about Dilla's Delights Vol 1 & Vol. 2? Each one is on its own limited color vinyl (Vol 1 on green and Vol 2 on purple), and a portion of the proceeds will directly benefit each of Dilla's two daughters, whose profiles grace the album covers.